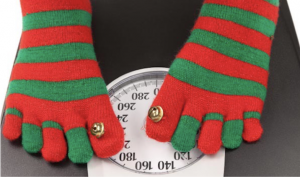 Dodging Christmas weight gain may sound as realistic as Father Christmas sliding down a chimney on Christmas Eve, but there are ways to stay on track at this time of the year. Many people expect weight gain during December, but packing on a few pounds is not inevitable. Don’t skip meals – A healthy breakfast will set you up to eat well for the rest of the day. Choose filling, healthy options such as eggs, porridge, or greek yoghurt with seeds and fruit. People who eat breakfast also eat less than other people throughout the day. Skipping breakfast or lunch in order to save yourself for dinner may lead to binge eating later. It’s also good idea to eat before you go out on any visits, Christmas parties or nights out. This will save you overindulging when the bread basket arrives or when the buffet is unveiled. Eat protein and fat – Protein can help maintain a healthy weight because high-protein diets are associated with greater satiety. Eat eggs, turkey, chicken, quinoa, lentils or beans. Cutting butter and oil can slash calories but not all fats are bad fats. We need fat in our diets to provide energy and absorb the fat-soluble vitamins A, D, E, and K, plus fat helps us feel full. Get healthy fats from avocado, nuts, and olive oil. Don’t pick at food – If you’re at a buffet, put any food you’re eating on a plate. This will help you keep track of your nibbling and avoid the mindless eating we all succumb to when there’s food everywhere. Take your own – Rather than try to figure out what’s in every dish at a friend’s party, take a healthy side dish or dessert so that you have a healthy alternative to fall back on. Choose treats wisely – Aim to choose something that you can only enjoy at Christmas such as eggnog or mince pies and not something that is available all the time. Try to enjoy sugar that comes in its natural form such as fruit, and just have small tastes of the desserts you really fancy. Wait before having seconds – The quicker you eat a meal, the less time you give your body to register that you feel full. It takes about 20 minutes for the brain to get the message that dinner’s been served, so take some 4me out before dishing up seconds. Eat less and more often – Divide your meals evenly throughout the day, and instead of having two big meals, have five smaller ones. Also, eating your dinner early and then going for a walk before going to bed will do wonders for your waistline. Enjoy Yourself – It’s important to set realistic diet plans at Christmas. Trying to restrain yourself totally from some foods will only make you eat more. Feel free to enjoy the treats that you really love, but in moderation. Don’t ban foods or punish yourself for indulgences. Instead, positive messages like ‘I can control my eating’ or ‘I’m proud that I ate responsibly today’ can reframe your relationship with food. Research shows positive expectations are associated with weight loss. Have healthy snacks to hand all day. Don’t leave home without them! Keep some in your bag so you don’t feel tempted to reach for a mince pie every time you’re peckish. Keep bowls of them at home, too. Festive treats aren’t all about chocolate truffles or a chunk of blue cheese – try tangerines or walnuts for a healthier Christmas treat.